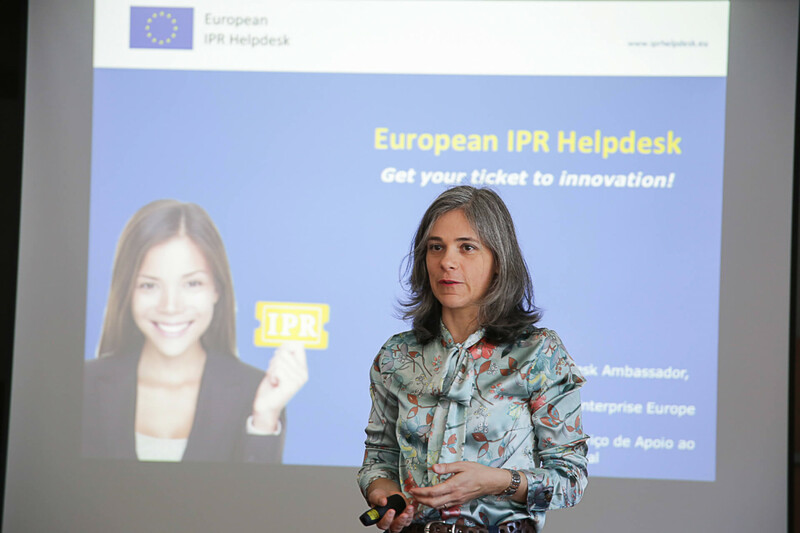 The workshop was conducted by Catarina Maia, member of the Enterprise Europe Network of INESC TEC and the Portuguese European IPR Helpdesk Ambassador. This workshop aimed to raise awareness on enterprises for the relevance of using intellectual property rights in business strategy and internationalisation. According to the European Union (EU), "small and medium-sized enterprises (SMEs) actively using IP generate 32% higher revenue per employee allowing them to offer more attractive wages and increase their workforce faster" *. ScaleUp PORTUGAL is a project funded by the COSME programme, one of the most important financial tools of EU for strengthening the competitiveness of European SMEs. The project, which is coordinated by INESC TEC's Centre for Innovation, Technology and Entrepreneurship (CITE), started in 2017 and will end at the end of 2018 and has an experimental character under the activities and services of Network. ScaleUp Portugal, which is addressed solely and exclusively to startups and young innovative companies that have successfully developed and launched their products and services and that show high potential to expand their business in international contexts, offers a set of services specifically designed to support those companies in their transition to a new level of development. Among the services offered by ScaleUp PORTUGAL are the training courses, that are workshops that deal with the thematic areas identified (in an early stage of project diagnosis), as relevant to the expansion process: funding access, intellectual property, organisational governance models and leadership, identification and development of international partnerships, business digitalisation, public procurement, marketing and communication, among others. On the behalf of Network, INESC TEC organised five events on intellectual property since 2016. Three of them were presented with the IPR SME Helpdesk project (European IPR Helpdesk; Latin America IPR SME Helpdesk and China IPR SME Helpdesk). The workshop was on the agenda of the European SME Week and was attended by several companies of the north and central region of Portugal and also by two Network partners, the Portuguese Entrepreneurial Association (AEP) and the Center Business Council (CEC). * Communication from the Commission to the European Parliament, The Council, The European Economic and Social Committee and The Committee of the Regions – “Europe's next leaders: the Start-up and Scale-up Initiative”.